Choosing the right neighborhood for you is critical when making a decision to purchase a home. Fortunately, We know the Washtenaw neighborhoods inside and out! This is where you can get an insider’s view on the real estate market. Location can greatly effect the quality of life beyond the features your home offers “inside the four walls”. Discover what is important to you when assesing a home’s location. You’ll find articles on selecting neighborhoods and using our specialized search tools; we highlight communities that offer value or have special features that many have overlooked. We also provide advice on picking school districts, assessing crime rates, commuting, walkability, environmental issues and many more considerations. Here you can also learn about individual Ann Arbor neighborhoods, Ann Arbor suburbs, and Washtenaw school districts. 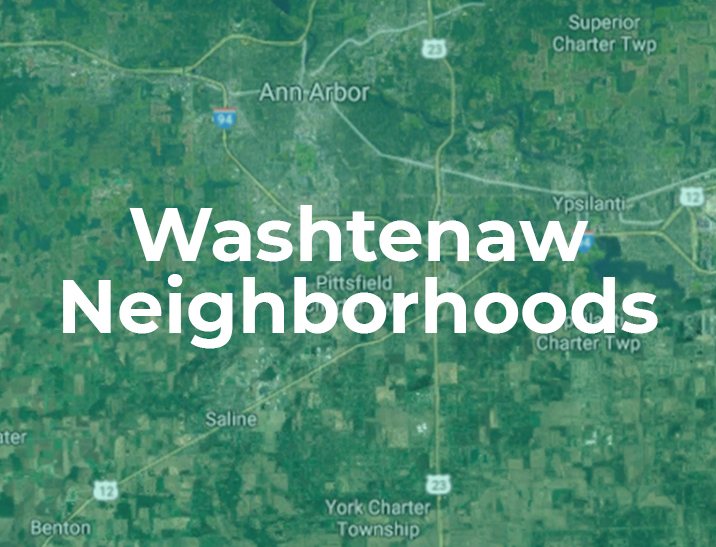 You may find new locations to expand your homebuying search after seeing all the great options in Washtenaw county! Contact us today for a no-obligation home buying consultation. Get a free estimated value report of your home here! How Am I Going to Get Rid Of All This Stuff? Parkside Preserve, Greene Farms, Creekside – Ypsilanti Township Neighborhoods Offer Great Value.